Danielle Hulan walked into a yoga practice (in India!) 10 years ago, and fell into an inexplicable love. The best part? Learning about herself on the mat, and taking these teachings out into her life. Today, Danielle teaches a grounded, slow, and stress releasing flow. With a special interest in connecting people with their breath and bodies, Danielle integrates her 200hr yoga training into her therapy practice. In her spare time you can find her sipping coffee, exploring Toronto neighbourhoods and trails, and chasing after her adventurous little baby. Helena McKinney has always had a passion and knowledge for movement, but through yoga she has discovered how to move more mindfully and live more consciously. In 2012, Helena established In Fine Feather Yoga in Hamilton after receiving her Teacher Training certificate. 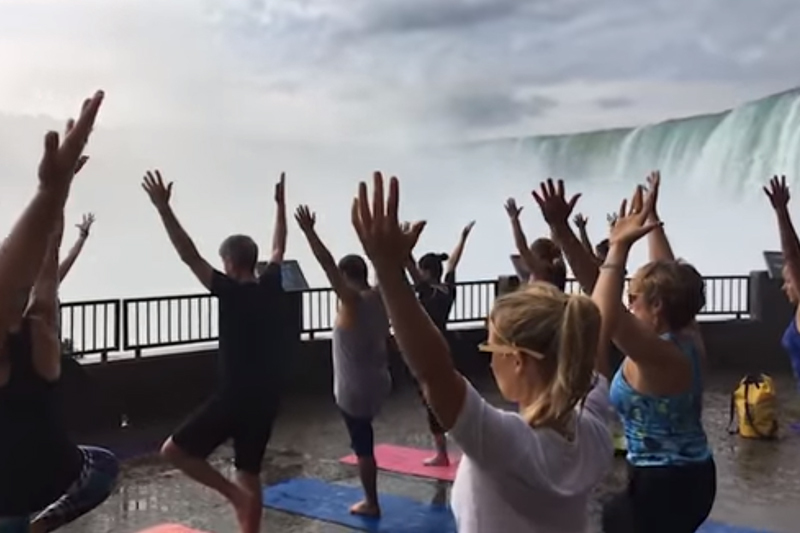 Last summer, Helena helped lead two Namaste Niagara yoga classes at Journey Behind the Falls and this year she will will be joined by her talented team of instructors who will be sharing the sessions. Consider making reservations for lunch at the Skylon Tower after the event!